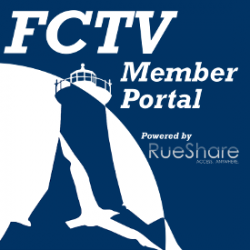 The primary role of FCTV staff is to train community producers, maintain equipment and facilities, schedule programming and equipment, and bring community volunteers together in an environment that will foster community communications in Falmouth. Debra Rogers has worked in community media for 30 years. For the last 16 years she has served as the executive director and CEO of Falmouth Community Television in Massachusetts. Bob Fenstermaker has worked in professional broadcasting for over 25 years. He returned to Falmouth with his wife and daughter back in 1997 to the Town in which he grew up. Lorre-jo just started at FCTV and is looking forward to working with all staff and members. Prior to this, her career encompassed over six years serving as Legislative Liaison to State Representative Tim Madden, and working as Office Manager for various corporations. Lorre-jo and her husband James live in Falmouth, and she is the proud mother of Scottie and Taryn. Geoff Wyman has worked in video production for over 15 years for various organizations all around the country. After graduating from The University at Buffalo with a B.A. in Documentary Film and another B.S. in Sociology he immediately took a head camera position for a company based in Buffalo, NY. Allen Russell is the Production & Education Coordinator at FCTV. Allen is a graduate of Fitchburg State University where he earned his BS degree in Communications with concentrations in both video production and a minor in international studies. He has worked in community television for three years, first in Raynham, MA and then at the Lakeville community television station. Ryan Webber has worked in professional broadcasting for over 15 years. He is a graduate of the University of Vermont, where he earned his BS degree in Cell and Molecular Biology with minors in Psychology and Chemistry. Anthony Sadera is an experienced web developer, programmer, trainer, videographer, audio engineer, copywriter and announcer. Originally from the Berkshires, and educated at Boston University's School of Public Communication, Anthony's career began in radio where he was the Morning DJ and Producer for the award-winning Pioneer Valley station WRSI. Andrew Richards brings over 30 years of experience and expertise in community and municipal television operations and programming. Originally from Ossining New York, Andrew graduated in 1983 with a B.A. in English from Syracuse University, where he was actively involved in University Union Television (now CitrusTV), an entirely student-run television station. Marcia has worked for over 30 years in the visual and graphic arts, and in the printing and publishing industry. She has served as artist, illustrator, designer, editorial cartoonist, writer and art director at newspapers, magazines, printing companies, and in her own graphics and printing business on Cape Cod for fifteen years.